It was a sunny Friday afternoon in Sitka, and there was not a high school student in sight. 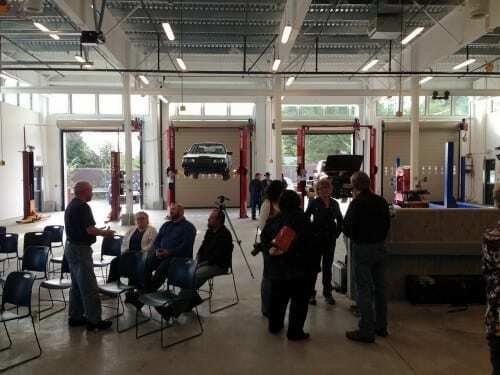 But that didn’t stop around 30 elected officials, school administrators and faculty, and appreciative members of the public, from dedicating Sitka’s new CTE, or Career and Technical Education building. 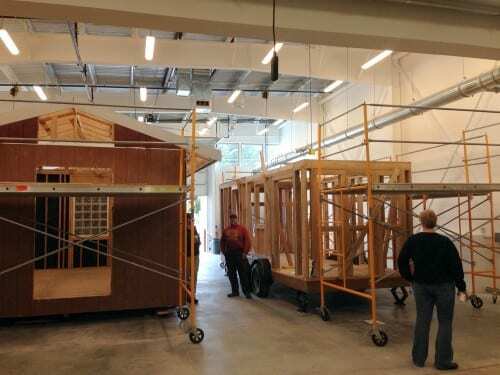 The $2.9-million structure encloses a total of 8,500 square feet of floor space, and means that Sitka students can fabricate metal, work on cars and boats, or even construct small buildings while never having to step outdoors. The CTE completes a vision formed years ago in the minds of Sitka’s vocational educators, who want to train students in every step of modern industrial production, from computer-aided design and 3-D printing, to casting, machining, and assembly. Randy Hughey – So thank you so much for coming everyone. There’s Ben’s root beer, there’s cookies. There’s cool stuff going on. Thank you all for coming. It’s now the open house. This may be the last time anyone’s going to eat cookies in Sitka’s new Career and Technical Education center, or CTE. It’s just a matter of time before this huge, warehouse-like building attached to Sitka High will be ankle deep in metal shavings and sawdust. The CTE was the brainchild of Randy Hughey, the now-retired woodshop instructor who’s directing us to the cookies, and Tim Pike, who’s still teaching metals and auto shop. He takes me on a tour of the automotive area, where four lifts have been installed. Pike – The old shop, we did a lot of great work in there, but it was cramped. This expansion helps students see the possibilities, and go forward. KCAW – I’ve heard that cars are so hard to work on nowadays. 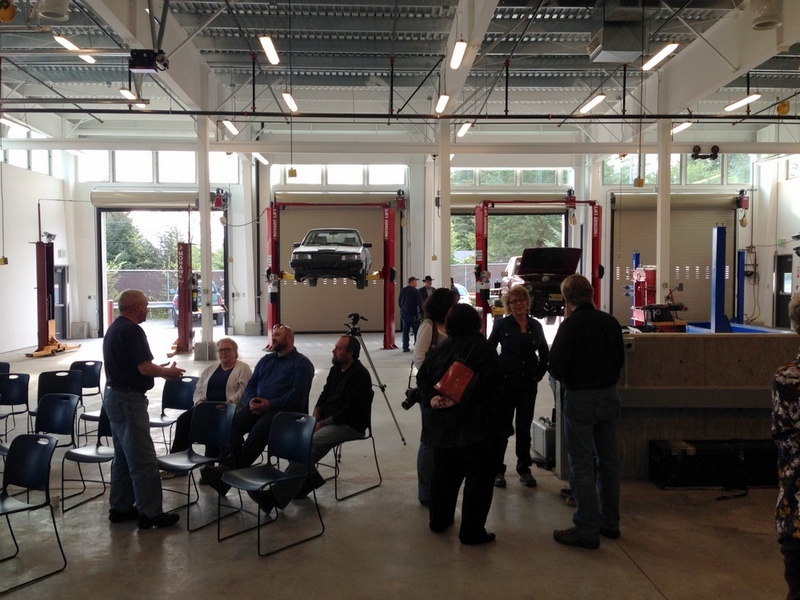 How has the automotive program changed? Pike – Well, we do a lot more talk about computers, but in some ways cars are easier to work on, because the computers do the thinking for you, unfortunately. So when you plug in your diagnostic tool you don’t have to worry so much about figuring out the mysterious symptoms, because the sensors will give you information that in the past you had to dig for. But in other ways, they’re more complicated. There are more symptoms to learn the integration of. So if there’s been a change, it’s been from the base understanding, to the base understanding plus understanding the integration of systems. Integration not just of automotive systems, but of fabrication and assembly systems. Moving the car lifts into the CTE has created room for a digital plasma cutter, which can create metal in shapes limited “only by the students imagination” Pike says. Another machine is cutting an aluminum gear for one of the outboard engines that line the walls. There’s space in the CTE to build anything from a skiff to a pretty substantial boat in the 30-foot range. Next door, just past the computer fabrication lab, Pike releases me into the company of Mike Vieira, who teaches woodshop. I’ve always thought this was an impressively large shop space, accommodating projects from small nameplates to large cabinets. Vieira had reservations about working indoors. Vieira is a second-generation vocational teacher at Sitka High. Two substantial sheds are under construction — maybe about 200 square feet each. Then there’s the tiny home: an actual 120 square foot house constructed on a flatbed trailer, that is designed to move every few years with its owners. Vieira says he got over his guilt when he saw how productive his students became in the CTE . The new facility means that students can think — and act — on a larger scale. Vieira says the tiny house will be the CTE’s first two-semester project. In a way, though, the CTE itself is a Sitka High project. The contractor, Chris Balovich, went through this program. Metals instructor Tim Pike believes we’ve come full circle in vocational education. KCAW – Do you see kids coming out of your program and going into the trades? Pike – Absolutely. Probably half of his crew building this building were my former students. KCAW – Does that concern you? Pike – (Laughs) Absolutely not!